Living with schizophrenia presents some complicated challenges. 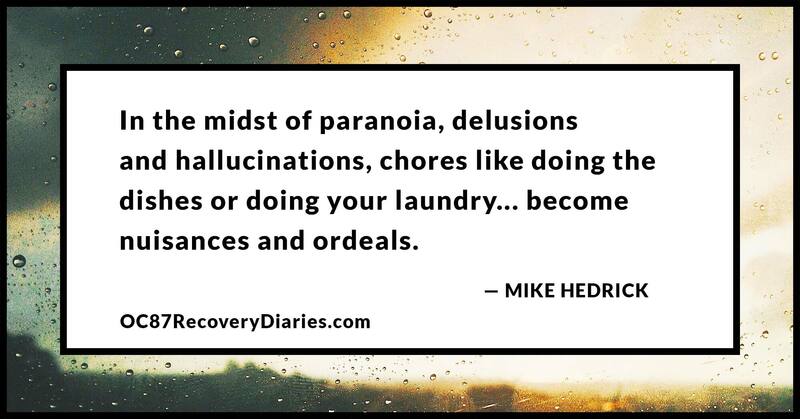 In the midst of paranoia, delusions and hallucinations, chores like doing the dishes or doing your laundry, and basic personal hygiene routines such as taking a shower and brushing your teeth become nuisances and ordeals. These basic tasks you have to perform to be a member of society fall by the wayside because they just don’t seem to matter at all when chaos is careening through your mind. It takes effort to do the things necessary to keep yourself, your house and your situation in good working order. 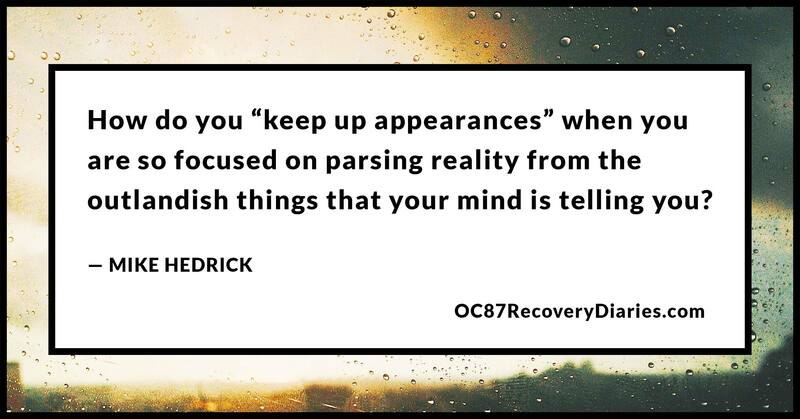 But how do you “keep up appearances” when you are so focused on parsing reality from the outlandish things that your mind is telling you? There are several things that have helped keep me fed and clean and somehow able to pay rent every month, and hopefully some of those things may help you or your loved one, too. I realize it may be too difficult for a lot of people with mental illness to completely take care of themselves but, like everything else, it’s a process. I’ve only incorporated these things into my life after years of repetition and I still don’t have them down completely. 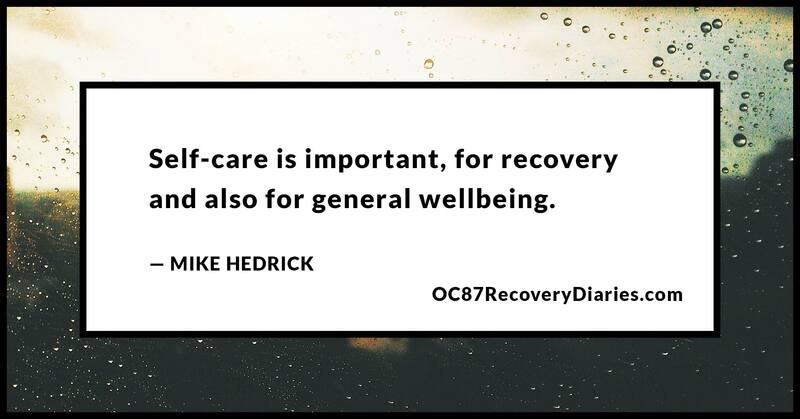 Still, self-care is important, for recovery and also for general well-being. I need to be conscious and mindful of my situation. I need to be aware of how I feel. Am I hungry? Do I feel dirty? Am I tired? These things may seem simple and completely self-explanatory but, when you have a mental illness; it’s easy to get so caught up in the things that your brain is telling you that you neglect some more basic necessities like cleanliness and hunger.Think of it like the state you’re in when immersed in a favorite book or entrancing video game: you lose track of time. The tipping point, for me, is when my anxiety about hygiene and hunger overrules my comfort. I’m extremely conscious about how I am regarded by people so, when I feel like I’m dirty or not right somehow, I will obsess and do everything I can to remedy the situation. I guess I can thank paranoia for that. This is, of course, probably not recommended thinking but I imagine that regulating self-care is something that you get better at with experience and increased stability. You take your meds, go to therapy and take care of yourself. That means treating yourself well and doing the things necessary to make sure you feel your best. For you, these necessities may include showers or naps, but be conscious of what’s going on to have a basis for what you need to do that day to keep yourself well, or others may tell you what you need. Thankfully, the instances where someone has said something to me about my hygiene are few and far between but the heartbreak and embarrassment of those situations is something I really don’t like and try my best to avoid. Another component of wellness is forming habits. This may mean exercising every morning, brushing your teeth every night or even making coffee every morning. It can take some serious motivation to get these tasks started but, if you keep at them long enough, you’ll form them into habits. I’ve heard from various sources that it takes 28 repetitions to form a concrete habit. I have no way of knowing whether that’s true or not, but forming habits is a great way to enhance wellness. Mind you, I’m still worse for wear when it comes to my habits. I still have a lot of trouble doing the simple things but I know that, once a habit is formed, that takes a lot of the stress of finding motivation out of the equation. Everyone has habits, some are good and some are bad, and these habits only formed because we’ve done them enough times. I’ve talked about the importance of routine for maintaining stability in other articles and I believe it’s one of the most important things we can do for ourselves. 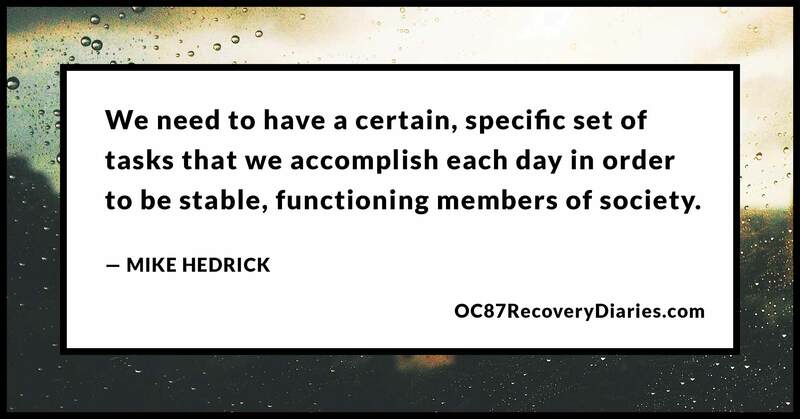 We need to have a certain, specific set of tasks that we accomplish each day in order to be stable, functioning members of society and these are things we usually don’t want to go without if we want to stay strong and healthy. 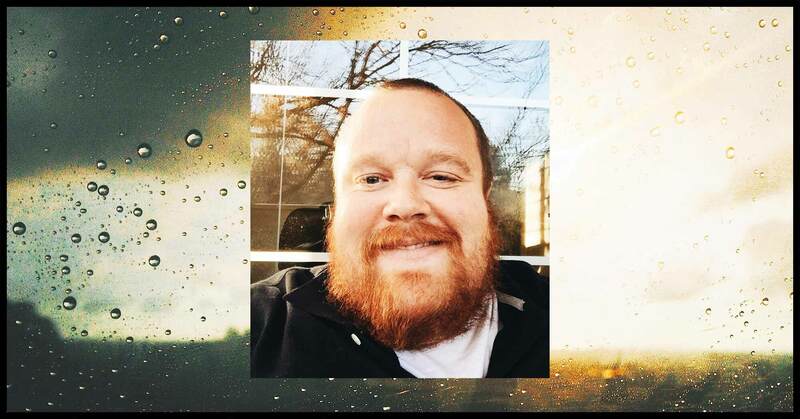 I realize that these things may take second fiddle to paranoia and delusions but, if we form habits, they will require less effort to complete every day. Lastly, we mustn’t forget about that good feeling we get when we accomplish tasks. Call this pride and, even if it’s just for taking a shower or brushing our teeth, we usually feel good after we’ve expended a bit of effort to maintain our wellbeing. 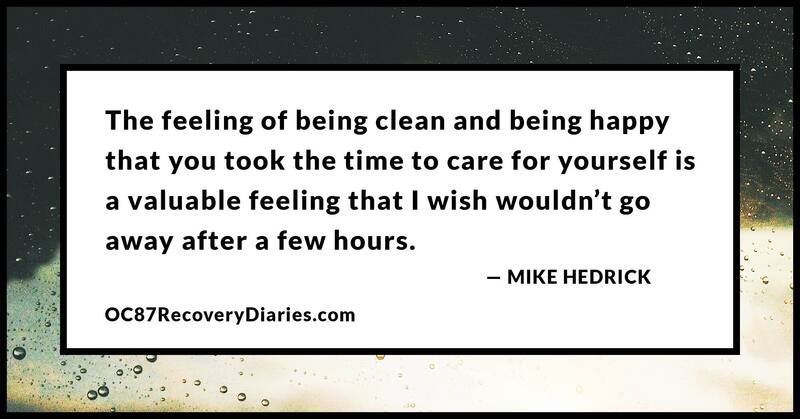 The feeling of being clean and being happy that you took the time to care for yourself is a valuable feeling that I wish wouldn’t go away after a few hours. We can chase that good feeling, though, we can get it if we take care of ourselves and we can get it regularly if we put in the effort everyday to do the things we need to do to maintain stability. In essence, taking care of ourselves requires some fortitude, especially in the face of a mountain of paranoia, delusions and hallucinations. 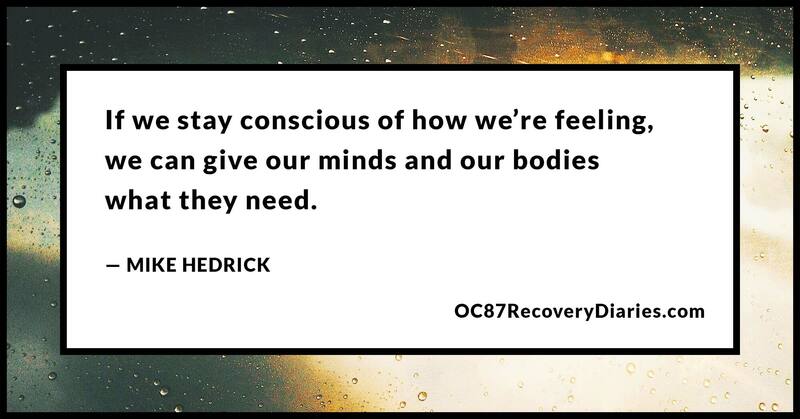 If we stay conscious of how we’re feeling, we can give our minds and our bodies what they need. If we form healthy habits and recognize the good feeling that comes after acts of self-care, we’ll be on our way to maintaining everyday human hygiene and wellbeing without thinking about it. I need this advice as much as anybody and so I remind myself as much as I remind you that taking care of yourself can have long-lasting and valuable benefits.